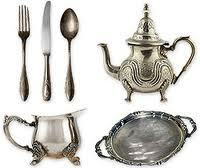 Identifying ‘real’ sterling silver – what to look for! I have clients and customers who ‘think’ they come across sterling silver pieces, but alas— it’s about half and half on the finds. Recently, a client came across many pieces with an interesting story. Someone in her family had been a naval officer (they are in their 90’s now I believe). This particular naval officer had somehow come in possession of navy platters which appeared for all purposes to be sterling silver. They had good weight, although very tarnished and not able to read the back, I began my research which first entailed cleaning the pieces. This is always fun and interesting work (that was a joke by the way). To take something that is so ugly in appearance, and then bringing it back to life is tremendously pleasing to say the least (that is fun actually –I’m a nerd….what can I say). This entry was posted in Estate Sale blog and tagged ajc, Atlanta Estate Sales, Kimy Kennedy, Peachtree Estate Sales, SS, Sterling Silver at an estate sale. Bookmark the permalink. ← The Big Apple called — they answered!